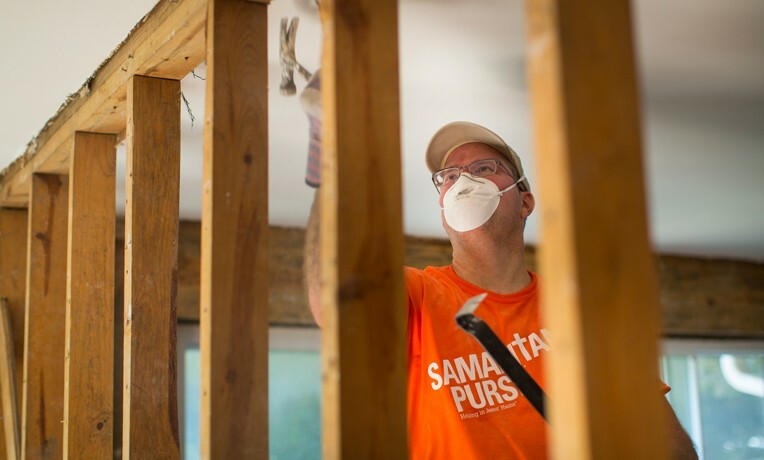 They're just two of thousands of Samaritan's Purse volunteers serving those affected by Hurricane Michael and other recent natural disasters. Hurricane Michael caused massive devastation across the Florida Panhandle, leaving Mexico Beach and other communities unrecognizable as nearly every house, landmark, and building was washed away. Thousands of volunteers have served with Samaritan’s Purse, helping hundreds of families recover from the storm. Darren Beers gathers with volunteers to sign a special Bible for homeowners in Florida. Darren and Colleen Beers are two volunteers who have made an impact. They came down from their home in Canada because they saw a need and wanted to show God’s love and compassion to hurricane victims who were hurting. The Beers understand that selfless service can change lives because they have experienced it. Both military veterans suffering from post-traumatic stress disorder, the Beers participated in the Samaritan’s Purse project, Operation Heal Our Patriots. This weeklong marriage enrichment training in Alaska was a turning point in their lives. God used this project and the staff and volunteers who served them daily to change their hearts. In 2016, in the Alaskan wilderness, Darren and Colleen found restoration for their crumbling marriage. Instead of continuing on a path towards divorce, they renewed their vows and were baptized in Lake Clark—making a new commitment to keep Jesus Christ at the center of their lives and marriage. This life-changing experience inspired them to volunteer with Samaritan’s Purse disaster relief. They wanted to be a part of helping people in need, whether it be a broken marriage or a destroyed home. Right now, Samaritan’s Purse is deployed in six different locations across the U.S. aiding families affected by Hurricane Florence in North Carolina, by Hurricane Michael in Florida and Georgia, and by wildfires in California. Go to spvolunteer.org to learn how you can get involved. Find out more about Operation Heal Our Patriots. Each year, Samaritan’s Purse offers one week in Alaska dedicated to wounded and injured Canadian military veterans, in addition to 15 weeks for U.S. military veterans.